Adobo is Filipino’s all-time favorite dish. A classic one inherited from our great colonizers the Spaniards but definitely filipinized to adopt to our palate. 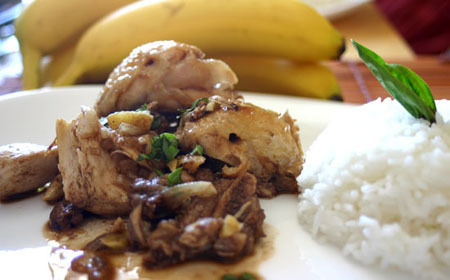 Adobo is so versatile we can almost do it with different kinds of meat, fish or even vegetables. Try this beautiful blending of chicken and pork simmered to perfection! Take note that they taste even better the next day! The secret to any adobo is the marinating sauce. And the key to its success is slow cooking. In a salad bowl mix half of the pounded garlic, with sugar, peppercorn, vinegar and soysauce; mix well. Put the cut chicken and the pork into this mixture and cover it. Let it marinate for about 24 hours. The next day put the marinated chicken and pork along with the sauce plus half a glass of water in a casserole and cover it. Let it simmer slowly over medium fire until the juice of the meat has come out and the sauce has reduced. Remove the cover of the casserole then put the cooking oil and the remaining garlic freshly pounded. Fry them altogether. Best served with pandan rice and eaten with your hands!